While the world catches up with VR, imperfect but affordable options for entry like Google Cardboard and Samsung’s Gear VR will get the job done. But augmented/mixed reality is also proving itself to be a ripe new field and for anyone looking to dip their toes in the water of this brave new world, the Holokit has come to save the day. 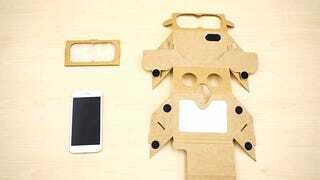 Like Google Cardboard, the Holokit uses a cardboard frame to house a smartphone. Two mirrors reflect what appears on your smartphone onto an angled Fresnel lens. Unlike Google Cardboard, you want to see through this setup because you’re mixing reality with imagery coming from your phone. Unfortunately, like Cardboard, there’s no headstrap. But you can always make your own. Open source tracking software will be released on Github along with the headset on June 6, 2017. Amber Garage is a startup focused on augmented reality. Its founder Botao Hu showed off the little DIY kit this week at the Augmented World Expo. A price hasn’t been announced yet but it seems reasonable to say it’ll cost more than the $15 that Google Cardboard does and less than the $100 or so that headsets like Gear VR go for. Checking out the video demonstration, it’s safe to say that this will be a big step down from an actual Hololens but the lowest tier development kits for that device for $3000. It’s hard to say if what you see is going to look totally bootleg or if it’s just tough to capture with a camera. Probably a little of both. Regardless, I like the low-res vibe. This is a perfect way for developers to tinker around with the technology without having to make such a major investment. I’m sure the lawyers at the software giant will be taking some issue with that name but Microsoft’s developers should seriously consider making one of these themselves. I look forward to playing with all the stuff you guys make for this thing. Check it out for yourself in the video below and it should be available here on June 6th.